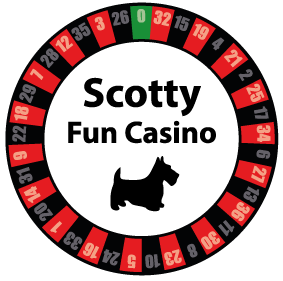 Scotty Fun Casino runs fun casino events for your pleasure and enjoyment with three casino tables available to hire – Roulette, Blackjack and Three-Card Poker. We will set up and run the whole event so you are free to share the fun of the casino experience with your guests. All tables are full-size professional luxury casino tables and we use a full size 32″ professional Roulette wheel. We use 11.5-gram chips, and Las Vegas playing cards providing the full casino experience with the thrill of gambling without losing a real penny. 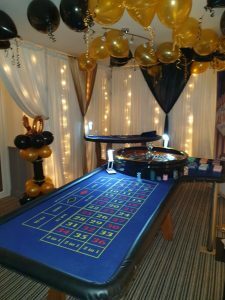 Our casino tables are available to hire for a range of events including birthday parties, weddings, themed events, charity and fundraising events. In addition, we also cater for house parties or any other event you would like us to attend. Guests must first be aware that this a fun casino provided for entertainment and a chance to win a prize. We will explain to guests all they need to know to be able to play the tables. They will be given fun money notes which they take to the tables to exchange for their chips and then the fun can begin. 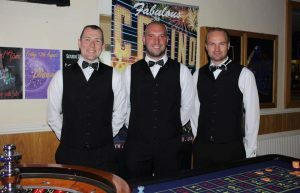 Our experienced croupiers will answer any questions throughout the event so anyone can play whether they have previous experience or not. The amount of ‘fun money’ guests receive will depend on the number of guests participating. Guests can cash out at any time and will be written a cheque which they can choose to take to another table and cash in for more chips to continue to play. OR keep the cheque until the gaming ends in the hope they have made enough money to win the prize. At the end of the 2.5 hours of play, the person with the highest cheque value wins a prize. We will provide a bottle of Champagne for the winner or you may choose to provide your own prize. We are a Fun Casino and only accept our own printed ‘fun money’ at the gaming tables. Full Public Liability Insurance of £5 Million, certificate provided. A £95 deposit is required to secure your booking. Until the deposit is paid the date is still open to other enquirers. In the event is cancelled your Deposit will be lost. The tables will open when the final payment is paid. Should your event be in excess of 50 miles from RM12 Hornchurch area then we will apply a small fee to cover petrol costs which will be agreed at the time of booking. All prices quoted are for 2.5 hours of gaming. Added time is charged at £40 Half hour £70 an hour. When I email you an agreement the final balance is due even if you downgrade your package. Any threatening/violent behaviour towards our staff will result in the gaming being stopped with no refund given. When the time allocated to gaming is up we will begin to dismantle and remove the tables and equipment with minimal disruption to your guests and the remainder of your event should it be continuing. Alternatively, we can return the following day to do this at an extra charge.